for more than two decades! Long-lost secrets that launched the successes of Anthony Robbins, Brian Tracy, Mark Victor Hansen, and some of the other wealthiest, most influential people in the world. More than 25 years ago, during an otherwise ordinary weekend, something took place that would change the courses and impact the fortunes of thousands of lives. On that weekend, the great Jim Rohn conducted a once-in-a-lifetime seminar that was destined to go down in history as one of the most incredible, transformational events of its kind ever held. The select group of men and women who attended that seminar were stunned by the revolutionary secrets Jim revealed to them during those two fateful days. They left forever changed. And many of them went on to become some of the wealthiest, most respected, most influential, and happiest people in the world today. As anyone in attendance that weekend would tell you, it was clear from the very start that this was an event unlike any other. There was a kind of magic, a sense of history in the making that ran like an electric current through the crowd. And so the presentation was recorded, its incredible messages preserved forever. These recordings were combined with additional exclusive Jim Rohn seminars, copied, and given to seminar participants to use as a refresher course. However, word of the collection's existence — and of its extraordinary content — quickly spread beyond the attendees. Soon corporations were clamoring to get it and happily paying as much as $1,295.00 for the privilege. Jim Rohn continued with his amazing work, inspiring and motivating audiences around the world to greatness. Yet there was something about that weekend seminar that no other event quite captured. It was a true loss. Then, not long ago, the production company that filmed these incredible presentations contacted Jim Rohn International and asked if they would be interested in buying the masters of the original footage of that weekend, as well as of other presentations. They couldn't believe their ears! There were more than 48 hours of vintage audio of Jim Rohn from 1981 through 1985! 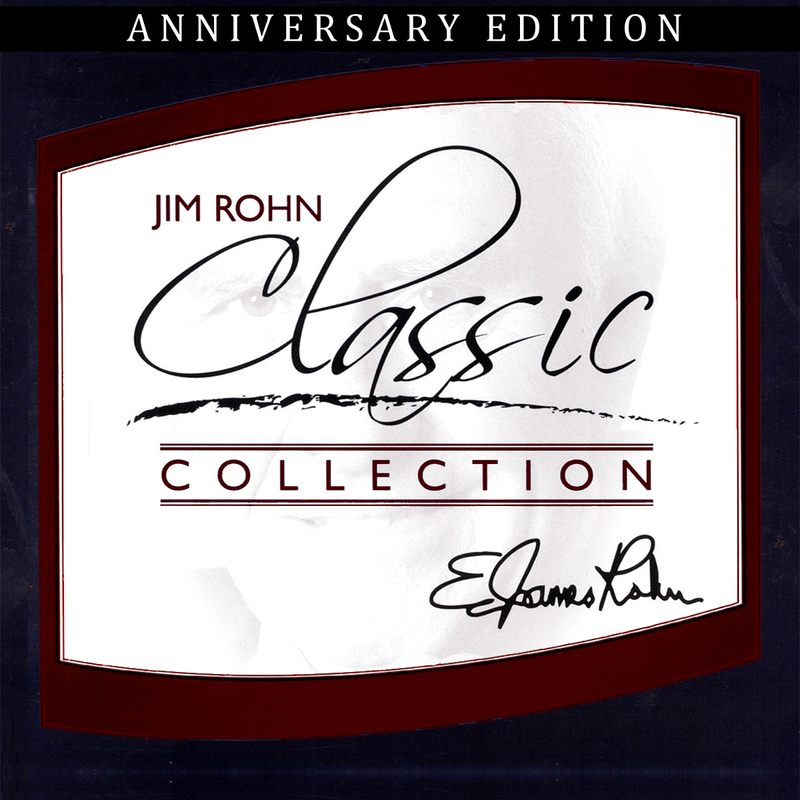 With meticulous editing and remastering, they were able to restore this amazing audio into an amazing CD library titled The Jim Rohn Classic Collection. And now it is my great pleasure to be able to offer YOU, through this collection, a "front-row seat" at the very same events that changed so many lives and created so many millionaires. I've known Jim Rohn and benefitted from his material for most of my adult life. Yet when I listened these Sessions, I was in awe. These secrets are as startlingly fresh, as shockingly brilliant, and as relevant and applicable today as they were more than 25 years ago! How to get your point across quickly and effectively almost every time with the 4 steps to effective communication. The 4 crucial elements to an effective presentation. Avoid all the rookie mistakes by sticking to a formula that works! How to become the person that people want to talk to. This is the secret to creating a quick bond with people. Jesus used this simple method to recruit his disciples. Create instant rapport with virtually anyone, even when they have nothing in common with you! What to do so that you'll never find yourself at a loss for words ever again. The little-known, but powerful, method of "attacking and confessing," and how it can help demolish the negative barriers of communication. What to do when all else fails. Use these tools of last resort in your final attempt to sway others to your point of view. The crucial thing to leave behind whenever you're communicating with someone. Miss this, and you might as well be talking to a wall. Secrets to GETTING PAID while getting a Ph.D. — equivalent education in psychology. Learning how to capture the attention of anyone you speak with almost instantly. What not to do so that you don't turn off the person you're trying to persuade. The secret of using the work of some of the greatest minds to your advantage. Get others to marvel at your genius... minus the work! The "stuff" that makes the agony of work and discipline a thing of the past. The 7 fundamentals of wealth and happiness. The 3 parts to successful living. How to increase your ability to solve problems by leaps and bounds. One of the best places to look for ideas. People go all over the place to look for ideas, but miss this one... because it's so blindingly obvious! The easy road to setting and achieving goals. The biggest (but avoidable) stumbling block on the road to success. Make sure you don't fall for this one, even (and especially) when times are hard! How the rich tackle their problems differently and how that simple difference separates them from the poor. 3 steps to solving any problem. One of the first steps people normally take is to ask help from others. Find out why you SHOULDN'T do that, and what you should do instead! The word (many consider a bad word) that can save you tons of time and energy! How to add days to your life when using this common modern appliance. If you want to go "from average to fortune", you need to know these 5 crucial steps. How you may be unconsciously making others hate you, and what to do about it. The kind of people who are lovely to hang out with but are hazardous to your success! What book to keep close to you at all times that will help you get the most out of life. What it means to be intelligently selfish ... and how it can make you wealthy. The best ways to solve your money worries. Why giving tips at the end of a meal may be causing the waiter or waitress to serve you badly, and what to do to ensure they wait on you hand and foot. The myth about attracting luck, and what you must really do to get it. The 80/20 rule, and how it can help you solve any problem using less energy, time, and money. How to win in any competition, even when you're a complete beginner! The 3-point checklist to find the right people for the right job. What every leader needs to do to make sure he or she has the very best people on his or her team. 5 things every leader needs to know. As I mentioned earlier, these recordings once sold for $1,295 a set at one time. In today's dollars, this collection would cost you more than $2,000 — and it would be well worth it, considering all the people who have applied the lessons learned from Jim's seminars and gone on to create mega-fortunes for themselves! — 15 DVDs PLUS 3 bonus DVDs — were limited, and are now SOLD OUT. — 15 CDs PLUS 3 bonus CDs — were limited, and are now SOLD OUT. — 15 MP3 Audio Sessions PLUS 3 bonus Audio Sessions — now availble for the first time in this format. Here's what I suggest you do when once you receive your program: Listen to every Session from start to finish. Listen to everything and discover all the secrets in them. Take down lots of notes if you wish. I'm certain you're going to be transformed by what you hear, learn and discover in this program. Jim Rohn has famously said, "The world cannot deny your place if you work on your gifts!" I sincerely believe that the secrets that you'll discover in these Sessions will help you unleash your gifts. P.S. When these recordings vanished more than 25 years ago, the personal development world suffered a major loss. Now that they have miraculously resurfaced and been digitally remastered, I urge you not to pass up this opportunity to experience one of the most monumental presentations of success ideas ever to take place, along with vintage Jim Rohn audio you won't see hear anywhere else. The information you will absorbe will impact you for the rest of your life. I want IN on the secrets that created countless millionaires and leaders and built profitable businesses — with my own "front-row seat" at the legendary Jim Rohn event where they were all revealed! Please send me The Jim Rohn Classic Collection for the special price below. I can select one of two ways of ordering.